I’m a motorcyclist and a cyclist, but between the two is a market that is going to transform the way we thing about each – electric bikes. The traditional electric bike is bulky, clumsy and looks like something you would be embarrassed to see your bulky grandmother on. This Trek bike is really just an updated version of history – it’s a beefed up bicycle with electric bits added on. Useful but ugly. 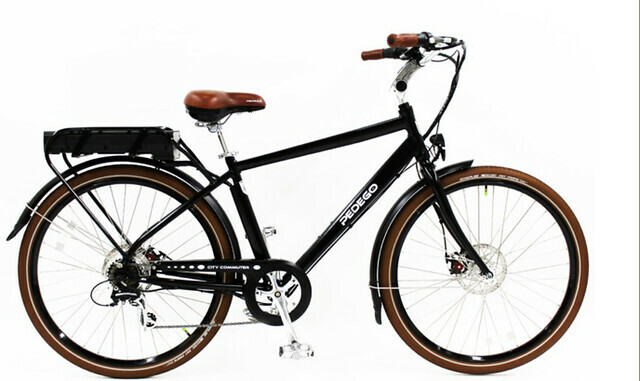 I took the Pedago shown below for a test-ride. It’s beefy, heavy and has design features that make it and the rider look old and stodgy. However the utility is incredible. That motor makes cycling up hills ridiculously easy, so it would transform an excursion over a big hill from a workout to a pleasant stroll. It will also speed up any longer commuting journeys, so that you’d be more likely to leave the car or motorbike in the garage. I almost bought one on the spot, but I suppose it was lucky that we cycled there rather than took the car. Offshore there are more of the same ilk, from the likes of Gepida, but also some new bikes which should make a lot more people reconsider electric cycling. This Bavarian Electric Touring Bicycle below has styling based on an old BMW R series motorcycle. It has a legally sized motor (under 300 Watts is an NZ requirement), carbon and aluminium bits and an impressively large 200 kilometre range. However the equally impressively large price of US$10,000 means that while I want one, I shall not be getting one. Imagine a version with decent panniers though, and then think about touring NZ. 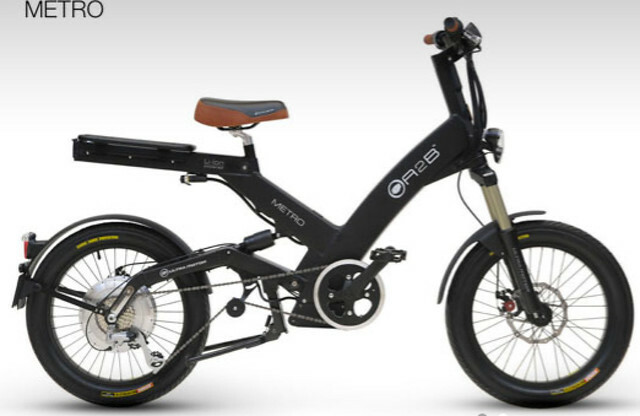 Specialised have launched but not yet released this sport electric bike, the Specialised Turbo. Designed by their own engineers who are speed freaks to be the fastest legal electric bike, it brings new levels of design refinement to the category. I wouldn’t say it’s very practical, but a whole lot of fun on a longer commute on a dry day. If I make it to Europe this year one would certainly be on my shopping list. But the price was also prohibitively steep at €5,500 (let’s call it NZ$9,500). However give it time, and some competition, and that price will drop within reach of ordinary humans. Across in the USA Optibike is doing similar design integration for the off-road bike sector. The bikes are fast, but at 1100W and 850W they are all too powerful to ride legally on the road in New Zealand, and that’s sad. If you have an offroad commute or want an easy way to exercise your downhill demons, then this (I’d take one) and the next bike are worth looking at. The Stealth silent bomber s one of three bikes that a bunch of mad Australians are making. I’ve asked, but there is no word on New Zealand distribution. The bikes seem to have more motorcycle than bicycle DNA, and the design is not as refined as the US ones above. But the power, oh the power. The bikes are in 3000W and 4500W options, and the top speeds and suspension capabilities reflect that. Think of them as light enduro motorcycles, and wish that they were road legal and available here. I’d get one in a second if I lived near a bunch of dirt. 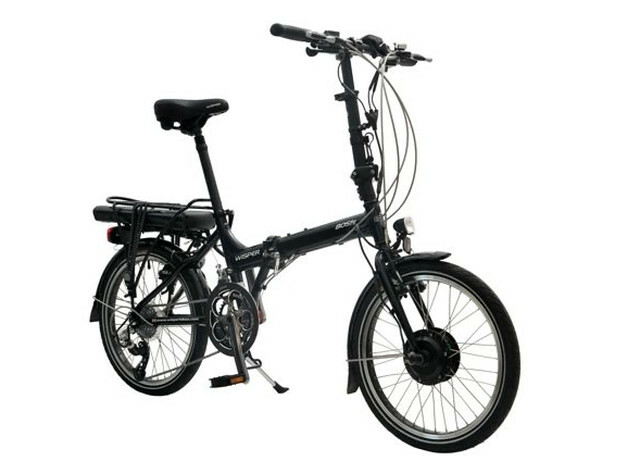 The rather unrefined looking design below is the Folding Lazerbike, listed at $2100 in New Zealand. It’s the importer’s favorite bike, and at 23Kg and with a 250W motor it is relatively light for an electric bike, but has legal power. The battery behind the seat design makes their standard bikes seem too long, but it seems to work for the folding model. 23 Kg is the limit for Air New Zealand domestic check-in, so one idea is to take the bike with 2 pannier bags. Take one pannier bag as carry on, put the battery into the other with more stuff and place the bike into a lightweight bike bag (carried on top of the rack.) The folded bike and panniers should be treated as ordinary luggage, and it would mean simple fuel efficient travel (aside from that flying bit). Aucklanders could take the bike on the bus on the long trip to and from the airport, and, Dunedin aside, be pretty set once they landed in the main centers. That commuting thing wouldn’t work for my last minute approach of course – far from it. The A2B Metro below isn’t legal here, at 500W (750W peak) output. The range, 20 miles, seems short, and the maximum speed is also limited to 20mph, so it’s a bit silly that this sort of bike is not legal in New Zealand. That dual suspension isn’t really necessary in New Zealand metro situations, but in some US cities (like Washington DC) the road surfaces are shockingly maintained. 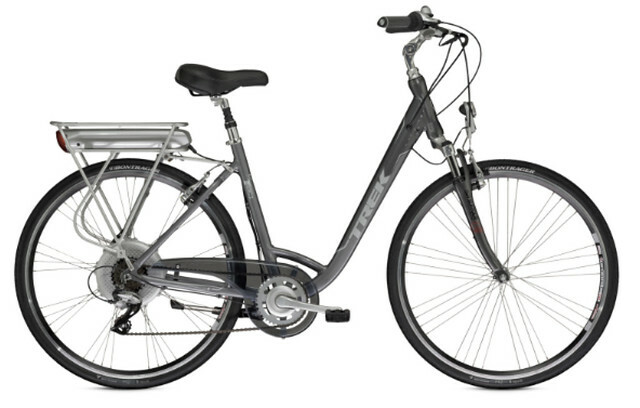 The Whisper bikes, available here, use a front drive approach, separating the pedalling from the drive. I would imagine that the temptation to forget about pedalling would take over for many. But electricbikes.co.nz also sell two kits to retrofit a front wheel drive system to your own bike. The Daahub in particular looks good, though even some pretty clever tweaking cannot remove the front wheel drive and tack-on nature of the solution. But there is an unused Surly bike in my collection that this could work well for. If you have decent hills or distance to traverse on your commute, then electric bikes transform exercising into an excursion, the equivalent of turning jogging into walking. This is particularly useful in Wellington and Auckland, where hills and distances play a big part in daily commutes. A great electric bike means that we would be far more likely to leave the car behind and take the bike, and taking the bike is an enjoyable thing to do. The more practical bikes have capacity to carry plenty of things on panniers, including rain gear, a decent lock and work clothes and materials. The less practical ones are a great way to experience the outdoors, getting up and down hills with ease, and extending your playtime. The battery life and range problems appear to be essentially solved. As battery density steadily rises and the bigger players start making in high volumes, we can expect to see prices drop and ranges increase further. Meanwhile several new classes of vehicle are being introduced. There’s the electric mountain bike, the long range tourer (thats the $10,000 one), the electric racer, and the bicycle that is a motorbike. We can expect to see more vehicles in the range, as I suspect we are at the horseless carriage stage of development. There are a few sticking points though. International laws are a mess of differences, and inadequate for the emerging future. In New Zealand we have a simple 300W limit, under which bikes are “not a motor vehicle”. But how do we cope with bikes of, say, 450W which are far closer to bicycles than motorbikes? Right now they are treated as mopeds, which are bikes with a maximum speed not exceeding 50 kph. Mopeds, however, need riders with heavy motorcycle helmets, and mirrors, a horn and brake lights. You have to have a car or motorcycle license to ride one, which is reasonable. They do not need a warrant of fitness, or to be registered, which is superb. But mopeds cannot use bike trails, which seems to push them into a very dangerous decision between high speed roads and slow speed bike lanes, on in particular is the one between Auckland’s North West motorway and parallel of the bike path. So there is a gap in here between motorbikes and bicycles that we are not adequately addressing. For bikes that are designed to be or ridden at 20-35 kph, requiring a motorcycle helmet and other heavy paraphernalia, and forbidding the use of bike lanes means that they will never sell. That means more cars on the road. And in general the requirement for helmets based on speed capability seems silly. Any of these bikes can exceed 50kph down a decent hill, as any half decent bicycle can. Should the elite groups of cyclists riding around Taupo be forced to wear motorcycle helmets then? That’s clearly absurd, but a middle ground is called for. I’d like to see a nuanced system that accepts that a full motorcycle helmet is not necessary (or practical) on light bikes, where only electric bikes with certain more aggressive attributes are subject to the moped regulatory system. The learner motorcycle system was switched way from engine size limits to a more nuanced approach, and we can do the same for bikes I’d like to see intermediate helmet requirements, like ski or skater helmets for intermediate bikes. I’d like to see a system where any electric bicycle bought into NZ can be easily adapted to legally ride on the road, under one of the three regimes. And finally yet first, I’d like to see tens of thousands of these on the road using a network of separated bike lanes, and for all of those lanes to have speed limits, and some to have dual speed limits. 1: Buy and use one – seriously. These are a lot of fun and will get you out of your car for errands and commutes that are much further away than you’d think. They are also serious fun. How much fun would it be to sell your car, and buy two or three electric bikes, pocketing the difference? I’d live to walk downstairs and pick a bike each day – not that I commute. 2: Lobby to fix the laws for the gap in the middle, and if you are a politician, how about raising a private member’s bill? Be sure to add the electric bike effect to any cases for bike lane networks too. 3: Build your own. Between Sheppard Industries (Avanti) and Yike we have clearly demonstrated the capability to design an incredible range of electric vehicles for our terrain. Lets get going. Pro bird or anti cat? – My bike racing history makes me a bit of a snob when it comes to electric bikes, kind of a “why not just pedal?” mentality. That said, I can see the utility for those who prefer to not work up quite the sweat that standard bikes do. 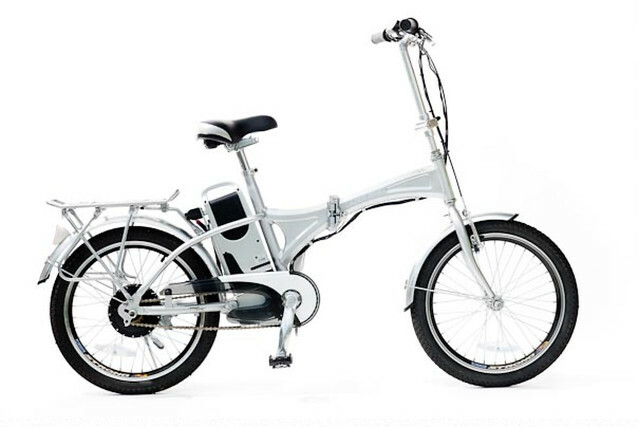 Anyway – just my 2 cents, I’m not sure we’re going to see any real breakout of electric bikes here in NZ, but as battery and motor technology develops maybe the tax in terms of weight and complexity to be paid to go electric will reduce…. The bike you described in Point #2 is exactly what we have now and I’ve been riding an older version of that about three years prior. These urban commuters definitely made me a better and more confident cyclist around town and I’d recommend either bike to anybody in a heartbeat. Bike racing (road?) is a whole different beast altogether. You don’t really want racing bikes on bike lanes hence Lance’s point about speed limits on the bike lanes. What segregated lanes do is increase the perception of safety — although cycling is relatively ‘safe’ but people just don’t feel ‘safe’ — and thereby encourage more bicycle users. I love using the NW Cycleway in Auckland. It’s the best part of the journey where I can just enjoy the ride and not have to worry about vehicles buzzing past me or not stopping to give way, etc. And everyone is always smiling! Tamaki Drive is the probably the best worst example of cycle lanes being nothing but an afterthought. This is a good point. I have chronic asthma, am 59, and now ride my bike regularly. it is a real struggle to ride from Henderson to Auckland because of the rises that run me out of breath. But I really enjoy riding. Instead of putting too much pressure on my heart and lungs an electric assist would help me up the hills and mean I can pedal and enjoy the whole trip. For this fantastic batteries are not needed. I estimate a total of 10 minutes power assist over the 2 1/2 hour return trip. The key is power assist bikes can get older unhealthy people back into exercise and perhaps even using their bike for transport. My daughter has just started using her bike for the commute from Henderson to Ponsonby each day. Faster than the car on the motorway. Without power assist. There is a place for electric assists, but not as a motorcycle alternative. The Specialised is what I would like to see, though probably with a front shock just to make it a bit nicer to ride. You could probably even ride it non motorised by taking out the battery and it shouldn’t be to much different to a normal bike in weight. 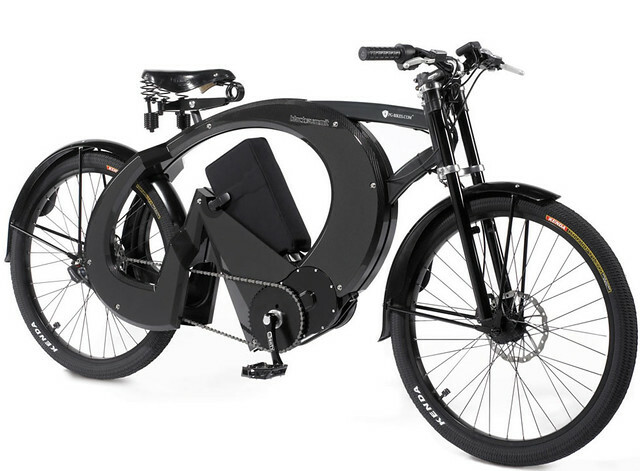 If they took it mainstream they should be able to bring the price down alot given the only difference between it and its normal $1k bike is one oversized tube and an electric drive system which others have been able to put into a bike for $2k. The Stealth bike looks mean but I would consider that an electric motorcross bike, not mountain bike so the road rules should be similar. Living at the bottom of a big hill, in quite a hilly area of Auckland, I do see the benefit in this. Just read the conversion kit writeup at electicbikes.co.nz. 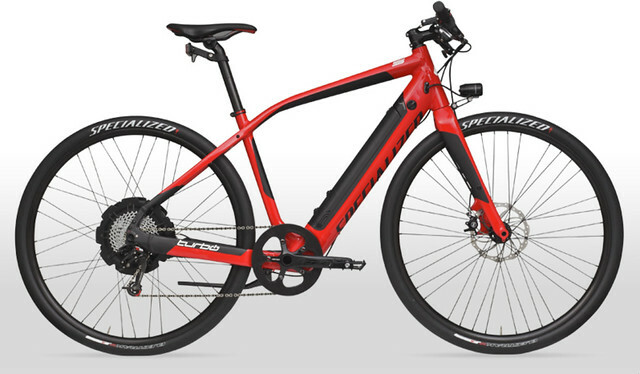 For $1.5k, you could add electic drive to your specialised mountain bike and the only difference is it would be front wheel drive (no biggy) and the battery wouldn’t be integrated into the frame (big down side from an aesthetic perspective). THere is no reason why Specialised couldn’t take it mainstream at a reasonable price so I can only assume there is not enough demand for them to do it. Hi Lance, this is a great market survey. I commute on a bike in Auckland. I live in Mt Eden and ride to the airport. I ride as a form of weight control, so the electric bike is not [yet] for me. However they are alive and well in the Auckland commuting scene – I regularly see two or three on my route and I am aware of lots of others in daily use. They greatly expand the radius someone can commute without requiring a shower and a change of clothes. I recently spoke to someone in sales who uses their electric bike for client visits around Manukau – brilliant. I am sure they could be used with a modest rain coat in most weathers. 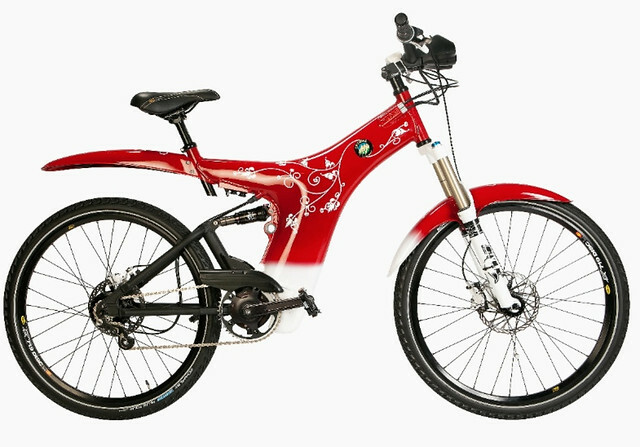 @CJ_NZ, look again at the Smart bike, it is 423 watt-hours, which describes how much energy is stored in the battery. The power outputs available are 200W, 250W and 350W. 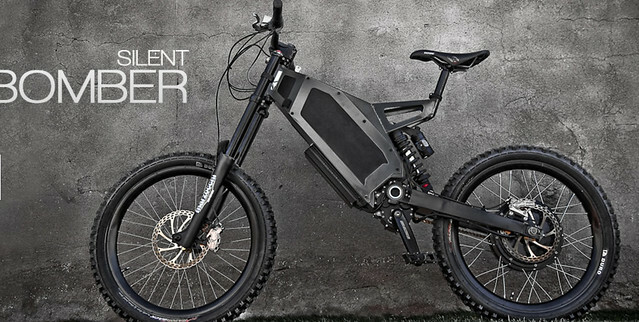 I think it is the best looking e-bike I have seen. You left out the KTM freeride E Lance, not a commuter, I know…. I commute Petone to Wellington each day on a yuba mundo cargo bike with $1700 electric front wheel conversion from EVlab: http://evlab.co.nz/electric-bikes-and-conversion-kits-new-zealand/. This enables me to have an 85 litre pannier which I put laptop etc in. Its working well. 50c per day commute. and I am commuting just about every day. EVlab tell me they are doing 1 conversion a day now. How long does the commute take, i’m thinking of buying an e-bike to commute from Alicetown to Wellington hospital. I have been following the electric bike revolution for a few years but held back until I felt the technology had matured enough to jump on board. In Feb this year I obtained the first true dedicated electric mountain bike to hit the market. Out of Spain, the BH Neo Jumper is a revelation. Returning to mountain biking after a decade long hiatus, courtesy of a debilitating knee aliment, I have been pleasantly surprised encountering your magazine. It offers variety, sharp layout and well written articles that in my humble opinion will appeal to most enthusiasts of the sport. Having just passed 60, I am most likely in a minority category of reader. The recent story (Feb-Mar 2013) profiling Alan and Liz Eskrick, leaves one under no illusions as to their zeal and fervor on back country trails. It will probably not be read by many in their age group, but it should be. For those who are drawn to the outdoors it is a motivating story. But it is easy to foresee the intimidating physical barriers that an over sixty would face if they were to try and rewrite the story featuring themselves. 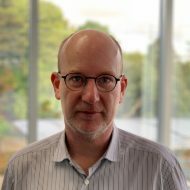 Cycling in general, and mountain biking in particular is on the precipice of change if emerging technology can connect with the burgeoning demographic of an aging population. The mere mention of electric bikes amongst biking enthusiasts whips up a frenzy of opinion, much of it predicated on the image of cheap, poor quality bikes, slapped together with no thought to aesthetics or function. Manufacturers were limited with the available technology of the day. Much of it was pretty primitive. That is changing in leaps and bounds.Lithium battery chemistry has advanced to a point where sufficient energy can be stored in enclosures small enough to be integrated into the frame. Motors are almost indistinguishable from an internal gear hub. Torque sensors in the dropout detect chain tension and deliver smooth and predictable power the moment you load the pedals. To the uninitiated the BH Neo Jumper appears to be a conventional dual suspension mountain bike. Designed and built by the Spanish who have a proud and distinguished heritage in off road two wheeled disciplines. Think of trails and enduros and names such as Montessa and Gasgas. Beneath it’s skin lies a high quality component package that includes an XT group set. There is enough energy in the battery charge to give me 40 to 50km of range off road under power. So that’s either uphill or into the wind. Downhill the chain is not under tension so the power is off. On the flat without a headwind I just pedal without the assist. I have ridden much of the single track around Wellington with not a hint of pain in my knees. With seventy percent assist, this bike flattens out hills up to twelve percent inclines like they don’t exist. Which makes all rides a pleasure to anticipate rather than the other way around. With the extra six kilograms of weight down low and evenly distributed, the balance handling and braking downhill, rivals my buddies four thousand dollar Giant. This bike is unquestionably, a blast to ride. So now I’m sitting with Dave Mitchell’s “Mountain Biking South” and planning my next rides. My wife’s Jumper is on order so that makes both of us with a goal to emulate Alan and Liz. But with some pedal assist. Two years ago thirty percent of New Zealanders were over fifty. Eighteen percent were over sixty. The numbers cannot be ignored. A magnificent recreational resource has been placed at our doorstep courtesy of a government with vision. The national cycleways project. Last year the first truly dedicated pedal assist mountain bikes were launched to the market. These are typical of converging developments to persuade aging Kiwis to get on a bike and explore the outdoors. No longer are they confronted with the barriers of age related degenerative disease and ailments that all of us eventually succumb to. There are boundless opportunities for the whole mountain biking fraternity, the media to the clubs, the manufacturers to the dealers, to engage with a groundswell of new potential. Ultimately this can only benefit all who have discovered mountain biking to be the twenty first century’s elixir of life. 2) I just completed the Dun Mountain bike trail in Nelson on the BH Neo Jumper, probably the most celebrated track in NZ, a continuous climb to 1000 metres and then a downhill to die for that would have to be the countries best downhill track, over 10kms of beautifully maintained flowing single track. It took two batteries to do this ride, 43Kms. Both batteries were freshly charged just before starting the ride. All riding was on Eco mode.The first one lasted just 13km of continuous climbing, no flat sections at all, up to 660 metres or what is known as the “third house” clearing. The second battery to me to the top, just short of 1000 meters with unbelievable views and then the remainder of the second charge was used to get back to base from the bottom of an incredible full on 10km of the best flowing single track you’ve ever encountered. I selected no assist for all of the downhill sections. The bike handled like a dream going downhill. I was in the middle of the pack of some seriously fit MTB riders some of who have down this track several times and ironman contestants. I’m 61 and technically an old codger. I stayed with the pack neither gaining nor loosing pace. The Jumper appeared to be more stable than a conventional MTB ( CMTB) tracking beautifully around the many bermed hairpins or switchbacks as the young ones call them.